This restaurant name gave the kids a big giggle and had them making up rather creative sentences for days to follow. 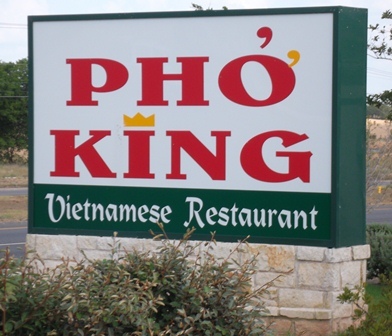 Things like, "Mom, do you think that Pho' King restaurant has any good food?" or "Mom, that building is almost the same size as the Pho' King restaurant in Texas." or "Mom, what Pho' King place can we eat at today?" We eventually had to outlaw the comments!